Easily add header or footers. Quickly see what is edited with new changing text boundaries. Quickly edit or remove headers and footers without going through page styles formatting. When a tab stop is set behind the end margin, the tab uses this value and does not go to a new line. A compatibility option has been added, thus only new documents will behave this way. When importing DOC, DOCX, and RTF files, the numberings are not split on new lines if they do not fit. This is only happening for layout compatibility with Microsoft Word. Grammar checking improvements (Cédric Bosdonnat) Reworked the grammar checking dialog to better show the error help. Grammar checkers can now add an optional URL to more details about the error in SingleProofreadingError::aProperties. The property needs to be named FullCommentURL. This link appears in the details area of the Grammar checking dialog and in the popup menu as an "Explanations..." item. Settings of English grammar checker: in Tools » Extension manager click on English dictionaries extension, and its Options button. Writer extension with a special grammar checking component + Lightproof editor toolbar. Run-time compilation and update of its grammar checking component. Debugging of user code (rule conditions and Python user functions. 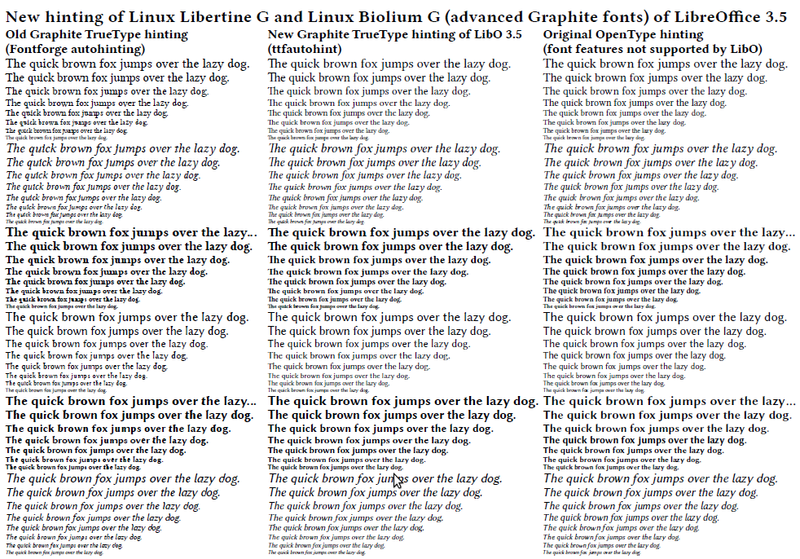 Linux Libertine typeface: new size variant Display Regular, updated fonts Bold and Semibold (also Bold and Semibold Italic), several other fixes and improvements. See ChangeLog and LinuxLibertine.org. Usage: choose "Linux Libertine Display G" in the font selector instead of "Linux Libertine G" for texts with 16 pt or more (Note: currently, there is only a Regular variant of Linux Libertine Display). In character formatting: select Linux Libertine G Bold for titles, and Semibold for highlighting inside paragraphs. Combining diacritics (extended Graphite port of the original OpenType features) for scientific typesetting and localization (eg. for IPA and African, Eskimo–Inuit etc. languages). Line chart's smoothing has been upgraded to the ODF 1.2 standard. (Regina Henschel) Closed lines which are smoothed using a “Cubic Spline” are now completely rounded. Open and closed lines which are smoothed using a “B-Spline” now go through the given points, interpolating between them. Elliptical arcs in path: Until now, the elliptical arcs in paths were ignored by LibreOffice and OpenOffice.org. With 3.5, elliptical arcs will be properly imported and rendered. Presenter Console now features a "Exchange Screen Images" button to work around the bug that in some cases the projector/presentation screen was picked for the Presenter Console instead of the speaker's laptop screen. (Michael Meeks, Astron). Better Custom Shapes and their Presets PPTX import. Custom Shapes import was greatly enhanced, many bugs were fixed and new presets implementation added. Try this example PPTX presentation with slide containing custom shapes identical to presets. In 3.5, it should look like the screenshot below, in older versions it shows a lot of problems (Radek Doulik): Cshape-all.pptx. The following image shows all the preset shapes as they were in the previous version (3.4) before the feature was improved. And this is how they now look in 3.5. The application color settings (Tools -> Options -> Appearance) now have correct color previews for ‘Automatic’ colors in the combo drop-downs. New object handles that use alpha transparency to improve usability. The legacy options of “Modern” vs. “Simple” and "Small" vs. "Large" handles were removed at the same time, to reduce toolbar clutter and user confusion (Tim Hardeck, Michael Meeks, Astron). The Extension Manager dialog now has 3 checkboxes to allow the selection of the type of extension to display: Bundled (Installation), Shared and User, or a combination of the three (Olivier Hallot). Related issues: fdo#43868 and fdo#40006. Support for Java 7 (1.7) added. User can select between Java 6 or 7 engine, if both are installed. Use of possessive genitive case and/or partitive month names if provided by a locale’s locale data (e.g., Russian, Polish, Finnish, Lithuanian, and others). If a day of month (D or DD) is present in a number formatter’s date format code, the month name for MMM or MMMM is displayed in possessive genitive case or partitive case. Else if no day of month is present, the month name is displayed as noun / nominative case. LibreOffice 3.5 supports 107 UI languages. Some presentations crash or do not show properly on MacOS X Lion. As a workaround, you can disable hardware acceleration deflagging a check box in Preferences/LibreOffice/View/Use Hardware Acceleration. See the complete list of open most annoying bugs here.